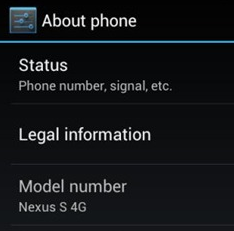 At the end of January, a leaked Ice Cream Sandwich 4.0.4 build IMM26 for the Sprint Nexus S 4G ended up online, indicating that a possible official release wasn't too far off. We heard this leak caused quite a bit of commotion within the companies involved, which may have had something to do with the XDA post getting wiped clean shortly after (although the poster did state he would only keep it going for a few days). Two weeks passed without any news, but the situation changed just a few minutes ago when we received a screenshot of one of Sprint's internal systems which clearly shows that this highly desired upgrade should finally be available February 16th. For those without a calendar handy, that's tomorrow. As in, go buy some balloons and throw a party (do you really have to ask what kind of party? An Ice Cream social, duh). The source of this information has always been reliable in the past, so unless Sprint is playing games with its employees, we should see the first OTAs firing up at some point tomorrow. As always, if we hear anything more concrete, we'll be sure to let you know as well. I posted an update on page 3 of this discussion about Sprint partnering with Samsung & Google working on ICS for the Nexus S. I did not provide a date then because ICS was not ready for release. Once I receive the date (most likely it will be the week of the release), I will update everyone here. I am sorry someone posted information that made it look like ICS was being released 2/16/12. We will post here in our Nexus S forum when the release is officially available. Back to the waiting room we go.